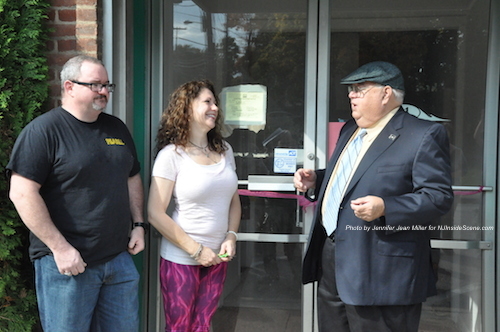 Keri Marino, owner of PEARLL Yoga for the Soul, opens the doors for her business with husband Tony (left) and Franklin Borough Mayor Paul Crowley (right). Photo by Jennifer Jean Miller. 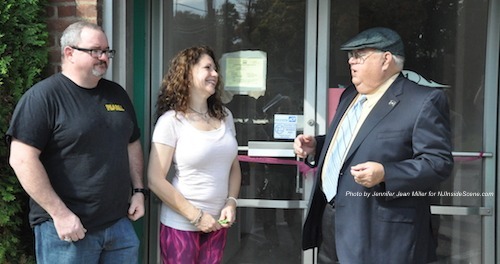 FRANKLIN BOROUGH, NJ – The dream of opening PEARLL Yoga for the Soul began approximately seven years ago for business owner, Keri Marino, and today became a reality as she cut the ribbon to her yoga studio with family and friends, her husband Tony, and Franklin Borough’s Mayor, Paul Crowley. 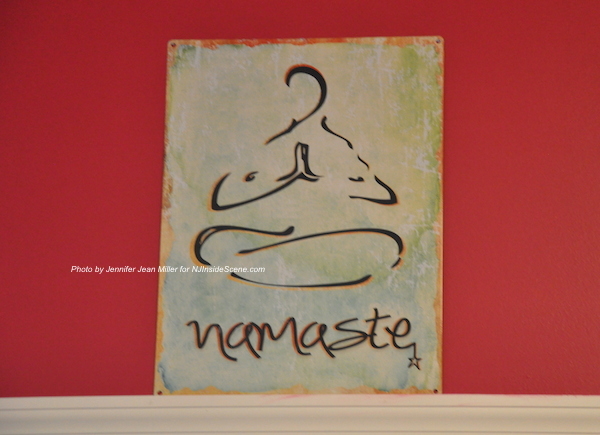 The welcoming sign in the front window of PEARLL Yoga for the Soul. Photo by Jennifer Jean Miller. “We’re glad that you chose Main Street in Franklin to start your business, and welcome,” Crowley said as guests at the grand opening celebration mingled in front of the location and took photos. “I thank each and every one of you, I couldn’t have done this without any of you,” Marino told the group, before cutting into the ribbon. 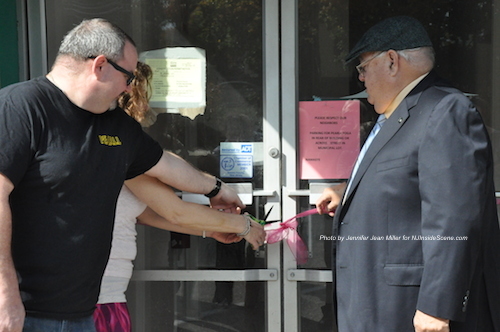 Cutting the ribbon for PEARLL Yoga for the Soul. Photo by Jennifer Jean Miller. Someone who she especially thanked was her husband, who she described as having been “amazing” with his efforts in helping with setting up the studio. Attendees followed the Marinos and Crowley into the studio for an open house reception with food from Café Pierrot, music by DJ Mayo, Henna Tattoos from Om-Age Henna Artist Jessica Lynne Small, and tours of the studio. 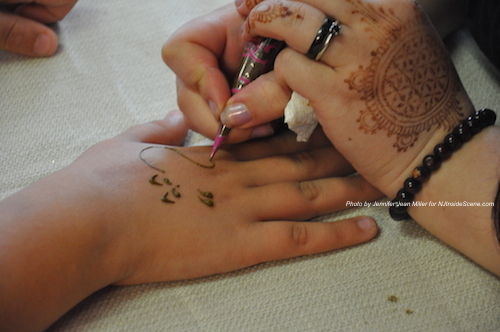 Henna Art at the event for PEARLL Yoga for the Soul. Photo by Jennifer Jean Miller. Another highlight of the event was a special concert with Dalien, also known as 13 Hands. Dalien, a two-time Grammy-nominated artist, shared his story of overcoming health issues with Crohn’s disease, and gave an enlightening and relaxing musical performance. Two-time Grammy nominee Dalien, also known as 13 Hands, at the beginning of his concert. Photo by Jennifer Jean Miller. The sign above the door to PEARLL’s studio. Photo by Jennifer Jean Miller. PEARLL’s sign to enter into the studio. Photo by Jennifer Jean Miller. Marino’s journey to help others began with her own story as a victim and survivor of domestic abuse within a previous relationship, a topic she speaks candidly about. 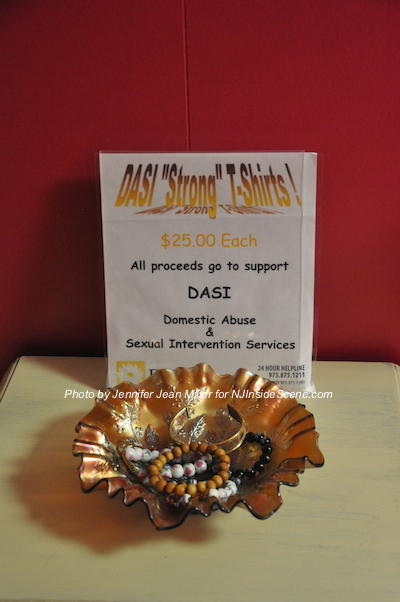 After seeking help from Domestic Abuse & Sexual Assault Intervention Services (DASI) in Newton as a client, Marino rebuilt her life, and eventually became a part of DASI’s board (Marino also volunteers her time with the Franklin Recreation Commission in town, as well as other organizations. She is additionally the vice president/business development sales manager for the Sparta and Andover branches of Sussex Bank). Marino said she had a wake-up call last year, as she was recovering from breast cancer. That is when she asked herself, what she was waiting for to bring the dream of PEARLL Yoga for the Soul to life, a way that she could give back to others. The airy studio is painted with a color that Marino described as “glazed raspberry.” She was seeking a color that symbolized the pink for breast cancer, and the purple used to represent domestic violence. 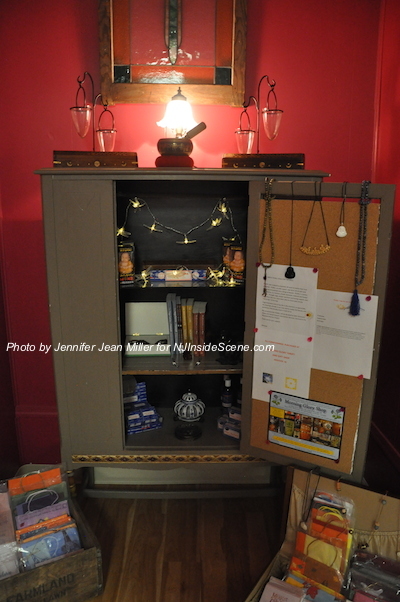 The hue gracing the walls in her studio is the result. Marino learned it was a fitting choice, as the combination, which falls into the magenta shade, represents “grounding” and is known as a color of serenity, she said. “There’s a beautiful aura in this room, it will be a beautiful place to practice yoga,” remarked Barbara Sullivan, one of PEARLL’s instructors. 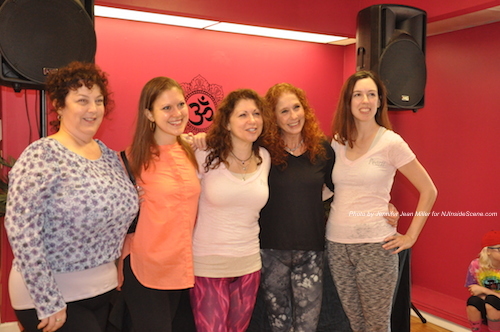 Keri Marino (center) with her fellow instructors at PEARLL Yoga for the Soul. Photo by Jennifer Jean Miller. PEARLL Yoga for the Soul offers a range of classes for $17 each, with five-class and 10-class cards available for purchase at special rates. Classes currently offered include: Teen Yoga, Vinyasa Alignment I & II, Mindful Flow I & II, Ashtanga Yoga Flow, Hatha Yoga, Mixed Level Vinyasa, Healing from the Inside Out, Gentle Restorative, Vinyasa I & II, Power Yoga Flow, Release, Relax and Let Go, Alignment and Flow, Gentle Flow Yoga, and Chair Yoga. All instructors are Yoga Alliance Registered Yoga Teachers (RYT). Marino personally began practicing yoga in June 2002. Click here to learn more about the classes at PEARLL Yoga for the Soul and the individual backgrounds of each instructor. 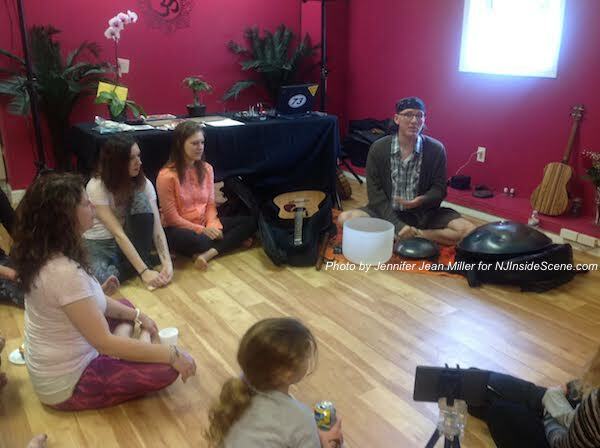 PEARLL Yoga for the Soul plans to offer workshops on pranayama, mudras, hafla and music therapy. There will additionally be support groups forming for survivors struggling with Post Traumatic Stress Disorder (PTSD). PEARLL Yoga for the Soul also has a gift shop with a variety of cards, gift wraps, gift bags, and more, with some items for sale created by the clients at SCARC, an organization that supports and empowers individuals with developmental disabilities. Items in PEARLL Yoga for the Soul’s Gift Shop. Photo by Jennifer Jean Miller. What separates PEARLL Yoga from many other businesses is that net proceeds from PEARLL are donated to DASI and the Wounded Warrior Project. PEARLL Yoga for the Soul’s tranquil gift area. Photo by Jennifer Jean Miller. 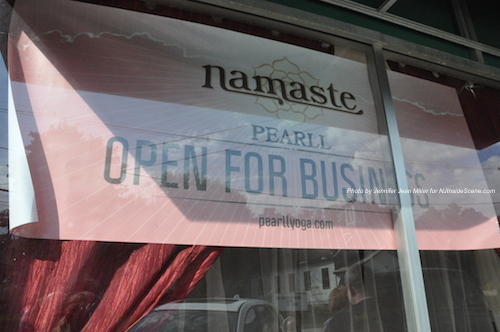 PEARLL Yoga for the Soul is located on 91 Main Street in Franklin. Click here for PEARLL Yoga for the Soul’s website and class schedule. Click here to like this business on Facebook. 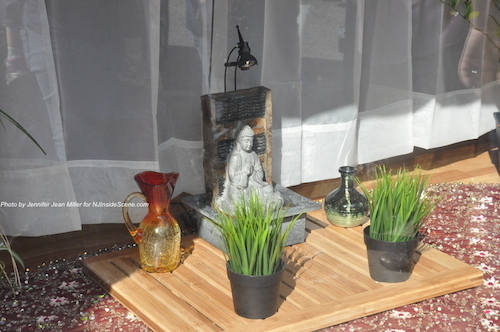 Sun beams into the front window and onto the bubbling fountain, in PEARLL Yoga for the Soul’s front window. Photo by Jennifer Jean Miller. 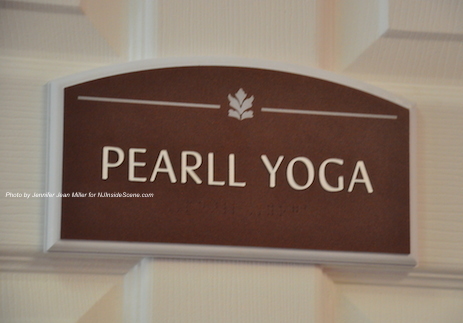 Editor’s Note: PEARLL Yoga for the Soul, is an advertiser on NJInsideScene.com. To learn more about becoming an advertiser, contact Jennifer Jean Miller at: jennifer@jjavenueproductions.com. 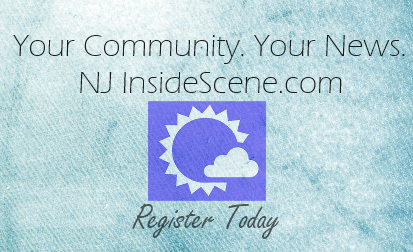 Stay on the Scene with NJInsideScene. Click here to follow us on Facebook.